George Colligan's blog: "Jazz Truth"
"This past Saturday night, my wife and I went out to hear some music. We didn't have definite plans, but after having a nice dinner, but we wanted to hear something good. We ended up at Portland Prime, which is right in the middle of downtown Portland. Since we had already eaten, we decided we would split a dessert and have (non- alcoholic) drinks. Our bill came to about 15 dollars without tip; we split a Berry Cobbler, I had a ginger ale and Kerry had hot tea. However, the music we heard for essentially free was amazing and an incredible bargain; The Mel Brown Trio featuring pianist Tony Pacini and bassist Ed Bennett is truly a Portland gem. Most Portland jazz fans know who Mel Brown is; he plays at Jimmy Mak's three times a week with various bands. He's a wonderful drummer and has the history of playing with some of the great Motown acts. 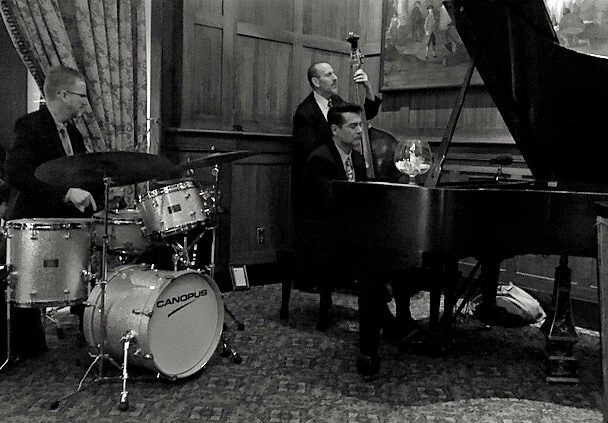 The driving force behind this trio is Mr. Pacini, who is impressively steeped in the old school jazz piano tradition and puts his own refreshing stamp on everything he plays. One thing that was really refreshing was to hear some different repertoire; not only did Pacini call some more obscure jazz tunes, like Duke Ellington's "Love You Madly," but he played a Monty Alexander tune and a Michel Petrucciani tune. ( Some people like to hear tunes they know. I also like to hear tunes I don't know; why play the same tunes all the time? There are so many- if you get bogged down in the same tunes all the time, you'll never learn any!) Pacini has fluid chops and a dynamic touch; it reminded me of Amhad Jamal and Oscar Peterson with perhaps some George Shearing and Milt Buckner and Errol Garner thrown in for good measure. He's truly a virtuoso. It really inspired me and my wife (also a pianist); I spent some extra time practicing this weekend thanks to Pacini's dazzling performance. This trio of Brown, Bennett, and Pacini has been playing every week for 18 years. They really have some stuff worked out! Jazz happens on the bandstand and this is a perfect example of when it's happening. I urge jazz lovers and especially students of jazz to take advantage of Portland Prime on Saturday nights; I felt like I got a lesson for 15 dollars that should have cost hundreds. Go hear the music!" "This is the album Tony's fans just knew would come along sooner or later. And let's hope there are "more from where this came from," so to speak. You see, this album gives Tony's ever-swinging trio (Ed Bennett, bass and Tim Rap, drums) an opportunity to record live before an attentive, enthusiastic audience. It also was an occasion upon which Tony had the privilege of playing a top of the line Yamaha, a piano valued at more than I paid for my first two houses! Given these plusses, Tony and his pals were at the top of their game, and having been in his audience that night, I can attest to that. It doesn't hurt at all that Tony chooses such evergreens as Freddie Freeloader, Stompin' At The Savoy, a funky Love For Sale and the rarely heard Brotherhood Of Man, all from the upbeat list. To these, add gorgeous renditions of Percy Faith's Maybe September and Thad Jones' tender A Child Is Born, both on the ballad side of things. Two expressive Pacini originals illustrate Tony's facility for writing attractive and cohesive melody lines, Beyond The Veil and First Light. Tony Pacini has grown in all facets of his music in recent years. He's getting more gigs and with his plentiful musical gifts strongly surfacing, deserves them. Catch him at Jimmy Mak's or Wilf's sometime soon. He's something special!" "Pianist Tony Pacini could. Perhaps Pacini should. But knowing him, my guess is Tony won't add a hip swagger to his walk upon the release of this - his finest work to date. The nine tracks contained herein are swinging proof that even the best on the Portland scene can take their performance to a higher level. Pacini opens with the classic "Freddie Freeloader," which he plays emphatically backed by his regular rhythm section of bassist Ed Bennett and drummer Tim Rap, both of whom are fully integrated into the goings on. Their support is not unlike that which Ahmad Jamal gets from Jamey Cammack and Idris Muhammad. Pacini pours his soul into the ballad "Maybe September." Rap uses his brushes with always just the right touch. There may be only a few ballads as beautiful as "A Child is Born" on which Pacini begins alone and is joined by Bennett and Rap for a treatment befitting that gorgeous ballad. There are two Pacini compositions included. "Beyond the Veil" is a moody but elegant selection. "First Light" speaks to a dawning of a new day or new beginning in a bright, uplifting way; a listener can feel encouraged while hearing it. This recording is more than a showcasing of trio work at it's best. It is, instead, an invitation to come hear them live. 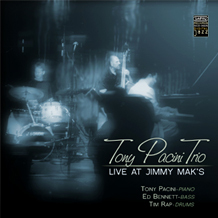 That opportunity will occur Saturday, Jan. 27 at Jimmy Mak's for Pacini's CD release party. 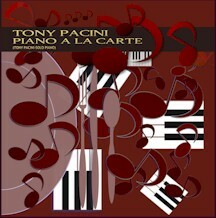 "Tony Pacini Hits His Stride"
CD: "Piano A La Carte"-solo piano. "Something's wonderfully retro about Tony Pacini's piano playing. His copious talents evoke earlier eras of jazz, when bop ruled in the most swingin' sense. On his previous trio recording, Pacini can be heard courting the likes of Bill Evans, Gene Harris and Bud Powell, all the while developing his own voice. On his second disc as a solo artist, "Piano a la Carte," Pacini steps back even further into the jazz canon, bringing a renewed sense of melody to classic tunes. Pacini is best known to Portland audiences as the pianist and musical director in the Mel Brown Quartet. His arrangements and stellar playing are featured on the quartet's disc "Girl Talk." But Pacini is also a fine artist on his own. "Piano a la Carte" is an impressively mature slice of musical history, especially coming from a Gen-Xer. The disc, a solo piano outing as the title suggests, treats standard tunes with reverence and a tender touch, showing a softer side of Pacini's persona while cementing him as one of the top pianists and arrangers on the Portland jazz scene. "Piano a la Carte" was intended to be a trio album, but executive producer Gary Fantz helped persuade Pacini to fly solo, without technical overdubs or splicing. The result is a disc of warm beauty, lighthearted strides, lush chordal structures and memorable melodies, all brought together by Pacini's sophisticated touch. "Gary kind of suggested making pretty piano music -- kind of salute a certain history of jazz piano," Pacini said. There are the obvious standards, like the drawn-out version of "Body "&" Soul" and the plaintive delivery of "Skylark." But in between are gems such as the bluesy "Lullaby of the Leaves" and the lean-into swing of "Come Rain or Come Shine," plus a couple of Pacini originals including the sweet ballad "Golden Boy." "In the studio I had fixed ideas about a handful of tunes, then I just played," Pacini said. What may be most impressive for fans is Pacini's use of stride piano, that infectious old-time rhythmic style. He looked to Art Tatum and other pianists of an early era for inspiration on such tunes as "Eastside Westside." "I think my truest followers and fans have heard me do hints of (stride). But most of the jazz community thinks of me in one style, going for the bluesy-meets-bop kind of stuff; stride is hard to do. Guys like Dave Frishberg make it look so easy." While this is a new sound for Pacini, it's something he had planned on doing eventually, even if not so soon in his solo career. Next up: a new Mel Brown Quartet album, and later a follow-up trio album. But first, a little quiet music." "Tony Pacini: The Ivories Are Sure To Get A Sound Workout"
"Tony Pacini is a fixture of the local jazz scene-a Portland native who attended the prestigious Berklee School of Music, the pianist and musical director of legendary jazz drummer Mel Brown's Quartet and leader of his own Tony Pacini Trio. He's also about to celebrate the release of his first solo piano project, "Piano a la Carte." 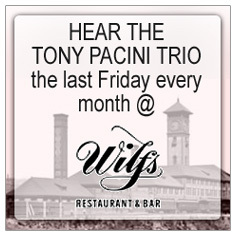 The retro-cozy confines of Wilf's (the bar adjacent to Union Station) is the perfect environment for experiencing Pacini's fluid and expressive playing. Whether interpreting standards like Duke Ellington's "Do Nothin' Til You Hear From Me" (which opens "Piano a la Carte") or his own songs like "Golden Boy" or album closer "Goodbyes," Pacini is a master of his material. Jaunty numbers and moody ballads come to life equally under his masterful playing. While he's been a featured player on many albums, "Piano a la Carte" is the first recording to feature Pacini exclusively in solo context. It's lovely and mesmerizing, the kind of emotive playing that's equally stunning and impressive whether you're a jazz fanatic or a newcomer to the genre." "I walked into Wilf's just in time to catch Tony's take on Lullaby of the Leaves, but since the place was absolutely packed, I had to listen from the back of the restaurant. He still sounded great. I sat with a very nice couple who were lucky enough to have wandered in on the right night. Pacini is respected among musicians and listeners alike as one of the top jazz pianists in the area (I think it goes way beyond the Northwest, though). Tony was joined by two of the best sidemen around, Ed Bennett (bass) and Tim Rap (drums). Following that trio tune, Tony launched into a series of solos - a showcase of his skills featured in his new solo piano CD release "Piano A La Carte." This particular set included Pure Imagination, Eastside Westside, Emily, and Moonlight in Vermont. Ed and Tim came back in to help out on Do Nothin' Till You Hear From Me, Ed's bass solo, solid and assertive. The final creation of the set started out with Bobby Timmons' Dat Dere, Tony slamming the keys, Tim hot on the tempo, the whole thing built up till you knew it couldn't get any higher - the crowd absolutely roared while the piano faded down and the bass took over keeping everyone glued to the stage (which really isn't there, but you'd swear these guys were eight feet in the air). Tony moved from that into a classical piece and from there, built the fire up again with Clifford Brown's Daahoud. We still had two sets to go. My, Oh My. At the break, I managed to commandeer a table about four feet from the keyboard with no obstructions to my view. To watch Tony Pacini play, even if you were deaf, would be a rare treat. Seeing his hands poised, ready to take the next solo, watching his eyes calculating where he wants to go with it, and then seeing him dive into it full-speed with no hesitation - it was just great to see a man enjoy his work so much. The second set started with a long piano intro, barely brushing the familiar melody of Just Friends, but you caught the tune as soon as the bass and drums came aboard. This was an up-tempo arrangement that had everybody bouncing. Tim's stick work intense and masterful, Ed not losing one inch to anyone on bass, and I thought the whole trio might get picked up for speeding. On his bass solo, Ed moved all around the melody in a veritable display of virtuosity, and then Tony and Tim traded fours, driving each other (and the crowd) into a frenzy. This was one great tune. Lil Darlin' showed up next as a soft ballad, very slow, deliberate and lush, then moved up a bit, featuring nice interplay between piano and bass, then on to a piano solo during which Tony's fingers tickled and caressed the keys with tender affection - eight people in audience fell in love, some with each other. Just to move the crowd from an "Ahhh" mood to a "Ohhhh" mood, Tony picks up the tempo with his left hand, double-timing with the right, then fading back to slow and gentle. Ed's bow was used to great effect during this passage. Those grouped around the musicians were riveted, but watching one couple, with a lovely young woman affectionately leaning on her guy's shoulder, dreamy-eyed, told the whole story. The ending had Ed and Tony playing the same chords, perfectly matched. I knew how the young woman felt. Even though many of us had died and gone on to heaven, Tony kept on playing, moving into a strong, bluesy Teach Me Tonight - once during the bass solo, which was lovely in a higher register, Tony looked over at me and gave me a sly look as if to say, "Is this fun or what?," then he pounded out a solid finish a la Gene Harris. This was beyond fun. The second set ended with a great rendition of Georgia, moving into a hot Sweet Georgia Brown that had my leg bouncing at about 90 miles and hour. Very inventive and featuring great work by Tim Rap trading back and forth with Tony. The third set was every bit as fine as the first two and featured some nice solo work by Mr. Pacini on Skylark and If I Loved You. This was a night to remember. Wilf's employees were marvelous in serving the crowd and being unobtrusive at the same time. This is a great, smoke-free venue for cool jazz and enjoying an evening out - great food, incredible music." -STEVE KULLOWATZ, editor: Jazzscene Magazine. "It's easy to understand why drummer Mel Brown employs Tony Pacini as his pianist and musical director. Guitarist Dan Faehnle, formerly touring with Diana Krall, regularly used Pacini in his group, too, as did the late great bassist Leroy Vinnegar. Like his star employers, the Portland native is a swinging, straight-ahead player with an affinity for the blues. At times recalling the late Gene Harris, Pacini's debut CD, "I'll Close My Eyes," documents his place among the first rank of regional pianists operating deep within the jazz tradition. It's a skill he's honed night after night on the bandstand in the company of other top instrumentalists, spinning out variations on familiar themes that include jazz standards such as "Line for Lyons" and the vintage pop of "This Could Be the Start of Something Big," which appear on this CD. But such ballads as "Chelsea Bridge" and several of the album's five originals reveal another side to Pacini. His "Pastel for Two," for instance, draws from the impressionistic Bill Evans' tradition with its pretty, flowing figures in the right hand. His stately, restrained rendition of Michel Legrand's "You Must Believe in Spring" also exhibits his taste for lush chords and quiet beauty. And Pacini's "Song for Marci" may be the prettiest melody in the collection. The beauty never interferes with the beat, though, nor does a more abstract, inventive version of "I'll Remember April" stop the syncopated propulsion at the heart of the straight-ahead tradition. For the most part Pacini ornaments rather than deconstructs familiar melodies, lending freshness with twists in time and new melodic lines. A well-schooled player, Pacini attended Boston's Berklee College of Music and has worked with a variety of great musicians. Here he displays that wide range to showcase his many talents. His true colors emerge in "Blues Medley," which contains the hard bop of Lee Morgan's "Speedball" (complete with a couple of Gene Harris licks), in the soul-jazz of "Mr. B.T." and in the album's lead song, "Time to Swing," where he rides the big, round tones of Ed Bennett's bass and Tim Rap's tasty drums. Bennett is featured often, but the album belongs to Pacini, whose performance demonstrates why he has become another jewel in Portland's mainstream jazz crown." -BY LYNN DARROCH, The Oregonian. "Pianist Pacini Shines on New Solo Album"
"Get ready to look deeply into the soul of Portland pianist Tony Pacini as you listen to his brand-spanking-new solo piano CD. Here he is, all alone with the total performance resting solidly on his broad shoulders. He is more than equal to the task. The recording was done from start to finish without any technical manipulation like splicing, editing or overdubbing. It's Pacini pure as fresh snow but much warmer. He begins with Ellington's "Do Nothin' Til You Hear From Me," and then slides into a very thoughtful and pretty treatment of "Moonlight in Vermont." Way before Pacini was born, there was a young man attending Grant High School who went on to world fame as a pianist-composer and vocal coach. Pacini takes one of Phil Moore's compositions, "Eastside Westside" and displays all the joyfulness written into it. Ah, but Pacini writes, also. He includes two of his own compositions among the 15 on the disc. The first is titled "Golden Boy" and is a pretty ballad with what could be described as an Ellingtonian influence. The second is "Goodbyes" and fittingly is the last song on the record. It is a somewhat somber piece, but far from morbid. Pacini includes his luscious interpretations of standards like "If I Loved You," "Skylark," "Come Rain or Come Shine," "Body and Soul," "Georgia" and others. Two of my favorites are "Emily" and "Come Sunday." This is a golden opportunity to become better acquainted with a pianist of depth and talent who honors those who wrote the songs he performs." "The Mel Brown Quartet" - with pianist/musical director Tony Pacini, guitarist Dan Balmer, bassist Ed Bennett and Brown on drums - has become a Wednesday night mainstay at Jimmy Mak's in the Pearl District. This CD will explain the band's continuing popularity over the long haul. It opens with the Pacini composition, "Dandyish," a sprightly piece with an easy-to-remember theme. Duke Ellington's "Prelude to a Kiss" gets an unfamiliar rapid-fire treatment from both Pacini and Balmer, which the live audience loved, interrupting with cheers and applause. Charlie Parker's "Yardbird Suite" is beneficiary of Pacini's piano with a nice share of block chords and his usual sparkling right hand. Ed Bennett contributes a melodic bass solo, followed by the swinging Balmer. It's great to see and hear Balmer's straight-ahead chops. Balmer shows the band's appreciation of club owner Jimmy Mak with his tune, "One for Jimmy Mak." Brown leads off with a very brief drum roll, and then it's an off-and-running. There is no weak link in either the band or the recording. It is solid through all 10 cuts, some of which include "Smile," "Gone With the Wind," "Ticondeep," "May Song" and more." CD: Mel Brown Quartet "Girl Talk"
"This first release from the Mel Brown Quartet (founded in 2002) is an excellent showcase for this exemplary group of players. The cream of Portland's bebop crop-featuring fleet, Phineas Newborn-esque pianist Tony Pacini, guitarist Dan Balmer (in a more Grant Greenish shade than with his Go By Train), and the ever-buoyant solid basswork of Ed Bennett. Led by jazz's arbiter of elegance, Mel Brown-a no-nonsense, tasteful drummer in the tradition of Ed Thigpen, Mel Lewis and Tootie Heath-the group lays down a steady mix of original tunes and choice standards (including Ellington's rarely played "Just Squeeze Me"). Impeccably recorded and expertly delivered-from razor-sharp bop tempos (especially the land-speed-record clip of Miles Davis' "Milestones"), jazz waltzes and ballads to perhaps the most milky midtempo version of Neil Hefti's "Girl Talk" you're likely to hear (sounding, to misparaphrase Eddie Condon, like she's saying "yes")." -BY TIM DUROCHE, Willamette Week. Mel Brown Quartet "Girl Talk"
"The notes on the back cover of Girl Talk, the new disc from the Mel Brown Quartet, proudly proclaim that the band has "over 100 years of collective experience." Indeed, an easy, lived-in approach defines the ten tracks on the album. It is the work of veterans whose professionalism yields consistently solid results. The musicians-Mel Brown (drums), Dan Balmer (guitar), Ed Bennett (bass), and Tony Pacini (piano)-are all bandleaders in their own right. Based in Portland, Oregon, the band came together in the fall of 2002. The title track gets a dreamy treatment with lush, deft brushwork from Brown. Pacini (who summons a crystalline solo) and Balmer caress the lovely melody with heightened sensitivity, causing the listener to wish they would just keep going and not allow the inevitable disappointment when the number comes to an end. Elsewhere, the quartet explores the elegant "Waltz For Theo," composed by Bennett. In addition to contributing the song, Bennett also offers a stimulating, full-throated solo. The hushed glow of Balmer's "Venus" is absolutely gorgeous, and the final track, Miles Davis' classic "Milestones," finds the band going at full throttle. Brown combines insistent cymbal work with speedy and powerful bomb clusters. Like the best up-tempo performances, it has a feel that it might simply accelerate off the rails, yet somehow it stays right on track. Girl Talk features some exceedingly strong, straightforward jazz. The Mel Brown Quartet plays with passion and evident joy. The album is warm and completely enjoyable." -BY STEPHEN LATESSA, All About Jazz. This brand new release is the first from a quartet that came together at Portland, Oregon's Jimmy Mak's jazz club three years ago. Led by legendary drummer Mel Brown, the quartet plays every Wednesday night at the club. Though Brown has been playing in the area for many years, the other three member have all been band leaders themselves. Guitarist Balmer is a real whiz, turning out some blistering solos as skilled as the very best of his ilk. 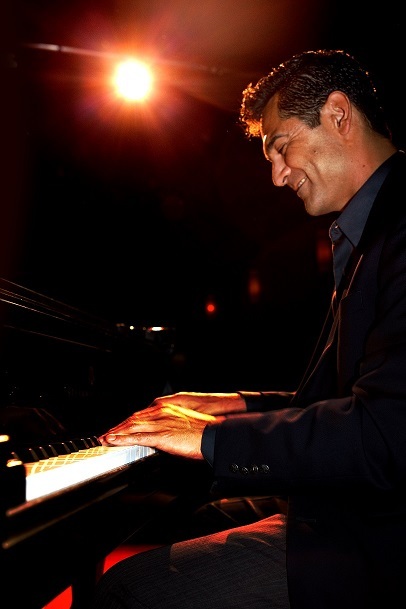 Pianist Pacini has a strong percussive style that is never obscured by the drums or guitar. This is straight-ahead modern jazz that swings like nobody's business. The mix and sonics are first rate too." Tracks: Brown Baggin,' Girl Talk, Now's Not the Time, Silverplated Song, Just Squeeze Me, Oldest Son, Venus, Good Friday, Waltz for Theo, Milestones. -BY JOHN HENRY, Audiophile Audition. Tony Pacini-piano, Dan Balmer-guitar, Ed Bennett-bass, Mel Brown-drums. "My first visit to the new Jimmy Mak's was a great one. The Mel Brown Quartet put out two sets with professionalism, timing and variety that matched the new surroundings. Portland is such a fine city: all of those outdoor attractions and activities within an hour's drive plus world-class live jazz on a Wednesday night in a cool new club. Life is better here! Tony Pacini appears to play keyboards with a very light touch. Yet he delivers a dynamic sound that frequently has the power of Gene Harris. His arrangement of Yardbird Suite has been with him for a long time, but was new to this aggregation. Balmer and Pacini each took extended solos, borrowing more than a few long phrases from other standards. Pacini can really move some very complex block chords around rapidly. By its end, the group seemed to have completely re-thought the whole Parker tune. Very exciting and the crowd got it. I had no idea what was coming when Dan Balmer played a pensive, out-of-tempo solo to introduce the rarely-heard chestnut Liza. Then Mel, Tony and Ed kicked the head at lightning speed. Pacini improvised using single-finger unisons for very long stretches. Its an impressive sound, particularly at this speed, because many pianists cannot carry it off for more than a few bars. Balmer, Bennett and Brown all took set-climaxing solos to the audience's prolonged applause. One of Henry Mancini's most durable jazz themes, Mr. Lucky, got a bright up-tempo treatment here. This has always been a favorite of mine, but Pacini's extensive block chording reminded me of the great harmonic progressions that are its foundation. Ed Bennett took a very thorough turn on the tune over Balmer's tasty rhythm guitar, while Pacini and Brown laid out. This can be a cumbersome tune to end as it was written, but the quartet chose instead a bluesy vamp to a fade-out -- Sweet. Mel Brown had Love for Sale totally under his control as it went from a funky A section to the traditional swing tempo of the bridge. Then it was back to the funk for some great solos by Bennett and Balmer. Brown reprised the swing-style bridge just often enough to feel like a window was opened to a warm breeze. Teach Me Tonight was my request and it was a treat. For me, the tempo is the thing that makes or breaks this tune. Without introduction, they started at the top in a swinging medium-tempo, allowing enough room for some gutsy solos frequently under-scored by prolonged rolling left-hand keyboard chords. Pacini has the endurance to keep this going long enough to build the tune's momentum, particularly when coupled with Mel Brown's expert showmanship. The new Jimmy Mak's club is focused, simply-stated and classy. Furnishings are very comfortable but not so posh as to make you wish you had worn a tie, unless you did and that's okay too. It's Portland. The lighting is quite good: subdued and moody, but not foggy or tomb-like. There are plenty of light sources but they don't intrude. The stage is well-positioned and the sound system manages to be visually interesting as well as efficient. There was some crowd noise coming from the bar itself, but most of this was confined to the back room which offers generous space for pool and conversation. This is definitely a place to take out-of-towners for an evening of Portland jazz. And the Mel Brown Quartet IS Portland Jazz."